If you paid attention to our last installment here, you will know who the subject of today's edition is. Syahmi Rawi is the brother of Zuhair Rawi. Together they form Malaysian post-rock duo Gespenst. 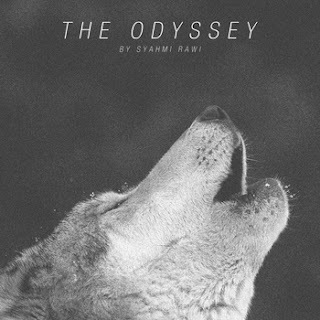 A few months ago I found a new solo EP called "The Odyssey." Fluttery Records more than mentioned the Gespenst connection, after my initial listen to "The Odyssey" I decided I needed to check out Gespenst. When talking about artists who are part of other bands, it is almost unavoidable making comparisons to said group, so I apologize in advance if this rubs any of you the wrong way. In contrast to the richly instrumental-driven Gespenst sound, Syahmi Rawi uses a more earthly sound constructed mostly of pianos and string arrangements. As such, it is a completely different style of post rock. I would even hesitate to call it post rock, as it is much more in line with Endless Melancholy or Olekksii. For an EP it is often difficult to say much about the music. There are still layered undertones of atmosphere present, but these influences are subtler and so, do not dominate the music. The album starts off with some heavy breathing set against a somber prelude of keyboard before the other instrumentals kicks in. This sound seems a little too bland for my tastes, but the intensity picks up when the labored breathing fades. This results in a more sonically pleasing sound. From there, the EP gets better and better. The minimalist string sections create an interesting juxtaposition with the soft and simple pianos. Rawi is a masterful musician. In contrast to Gespenst, there are very few electronic interruptions to the music. If I had to categorize "The Odyssey" with an established genre, I would label this as instrumental ambient music. As I have stated, this album is an EP which is composed of six short tracks. You can listen to the album stream below. If the breathing bothers you, you can always skip to the next track. Enjoy!